This article is just an amazing. I couldn’t even imagine that they teach a service dog so many commands. After reading your article it makes perfect sense. We marked your article as very helpful, and posted at Punditor.com. Puppies can be put in puppy training school to learn to socialize and after that, obedience school can follow. For service dogs, this is of course an imperative. I’m curious, what’s the meaning of the etiquette commands: ‘That’s all’ and ‘Careful’? ‘Leave it’ I’m sure of, but what would you teach a pup the other two to mean and how would you go about it? They’re quite abstract meanings where dogs really need simplicity mostly? Does that’s all mean ‘no more’ when eating / playing etc.? 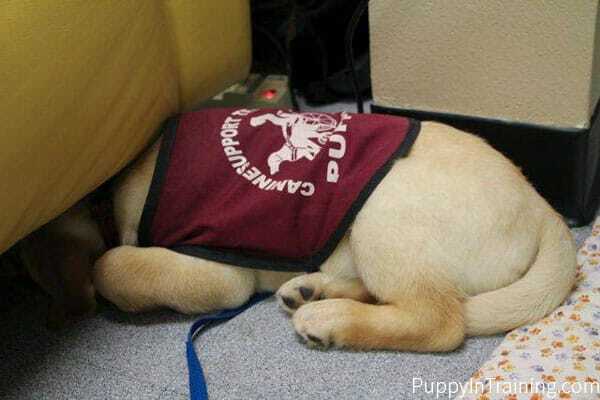 And ‘careful’, can you teach the puppy to slow down and be cautious? Seems incredibly hard, or have I got the meaning wrong? It is especially useful when you are in a restaurant or another place where it is inappropriate for the dog to do excessive licking or scratching. “Careful” – to approach a situation with gentleness and care. When he is doing a “My Lap” taking something from your hand, or touching you. Remember use a soft, calm, yet firm voice to get the dog to synchronize with you. Very interesting! 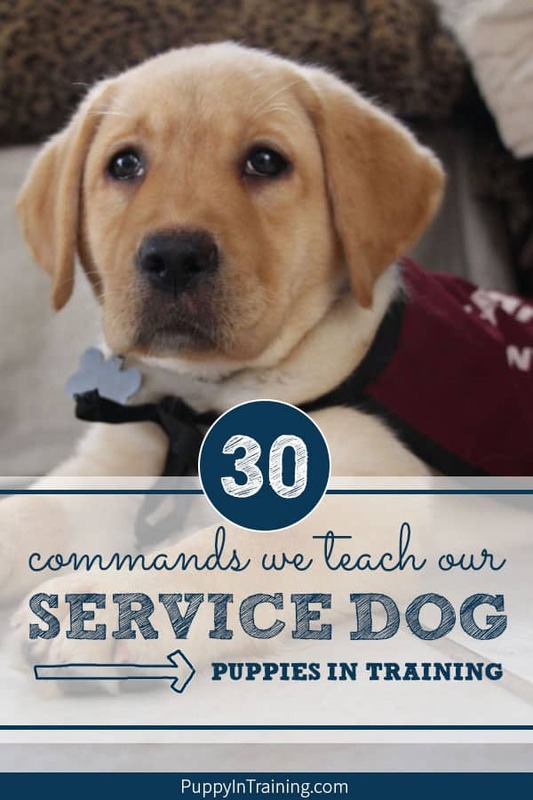 Of course, those 30 commands are words all dogs should learn. I had no idea there was such a difference between the guide dog pups and the service dog pups. I agree. All dogs should learn the majority of these commands. Adelle will end up learning about 120 commands when she’s done with her training. Well, thats a nice list of commands to teach your dog.. But, how can you make your dog learn not to bite you and other people around.. Can you please share your views when the dog is quite aggressive and keeps on barking on other people? You might want to check out this article on biting: https://puppyintraining.com/the-ultimate-guide-how-to-stop-a-puppy-from-biting-and-nipping/ If you’re having trouble with an aggressive dog you should probably consult a professional dog trainer for an in-home training session. Good luck with your training. No problem! Thanks for stopping by. I hope your GSD learns some of these Service Dog commands. Our friends recently brought home a new puppy to their home, and I wanted to help supply some training information, as opposed to just information on training “devices”. I was on a flight recently and there was a police dog in the airport and I thought, these dogs are so well trained, what’s the secret? 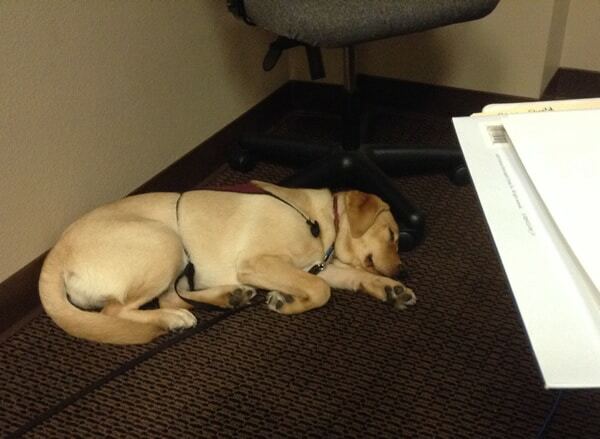 So I began investigating how the “service dog” is trained and it let me here. Shows that often times you really get what you put into the training. Cheers.